Do toddlers like to learn rules and follow directions? Are they capable of restraint, making decisions, self-discipline, patience, even unsolicited acts of kindness? This is the first few minutes of snack time (traditionally consisting of bananas and water in real glasses) in one of my RIE Parent/Infant Guidance Classes. The children choose whether to come to the table and join the party or not. They quickly learn the routine, and because they love rituals and feel empowered by them, they relish each aspect. Previous to this particular class, we’d done snack with this group 7 times. Some of the snack time rules (hand-wiping, bib-wearing) are not so strictly enforced. Others are, like sitting while you eat, not climbing on the table, and putting toys aside until snack time is over. As you can sense in the video, toddlers don’t feel hampered by these restrictions if they are given respectfully. Instead, they rise proudly to the occasion, or at least seem to appreciate the opportunity to test limits (depending on their mood that particular day). 1. Slow down. These activities are just as intriguing and educational for children (if not more so) than play. Babies need time to understand what we expect and respond appropriately, time to soak up our attention and intimacy. What’s the rush? 2. Invite participation and ask for cooperation. Babies are ready to actively participate in all aspects of their life from the very beginning, and that’s the way they like it. Rather than do things “to” babies or “for” them, do things “with” them. Be aware that infants and toddlers are developing at lightning speed and are each day capable of participating more actively, doing new things all by themselves. 3. Communicate. Talk babies through all the details, listen and respond to all their attempts to communicate. This is not only respectful, it is the best and most natural way for babies to learn language. 4. Pay full attention. Children need our nurturing presence during caregiving activities. These intervals of focused attention and connection each day refuel infants and toddlers, and make it possible for them to enjoy time away from us, playing independently. Thank for you video! This is beautiful to watch. I don’t know if it takes time to develop this organization? It wouldn’t happen on the first or second class, or would it? And I wonder, in the class we took, they had stools for this age group to sit on, why do you not use stools? My son wanted nothing to do with the stool and missed out on banana and it was horrible for me to watch. He could take it or leave it, so I didn’t react. The first time I tried snack in this group, I think I only had one customer and her parents had been feeding her this way at home, so she was used to it. For babies, it’s all about habits. They make them quickly and can break them quickly. I use the stools when the babies are a little older and all walking. Two of the babies in this class aren’t yet walking, and that makes it hard for them to sit on a stool independently. I’m sorry you had a bad experience. I try to reassure parents that the babies will participate in snack time when they are ready. There’s no rush. It’s just a snack and the babies aren’t going to starve or miss out. It’s really important that the babies choose this… Sometimes children do it one day, but not another and the parents get disappointed. I believe we have to trust the babies to do what they are ready to do (and interested in doing) that particular day. 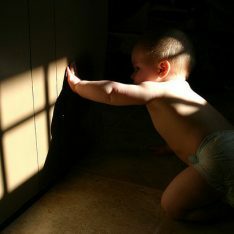 For example, a baby might be able to walk (or crawl) but not choose to move that way on a particular day. So what? Feeling a parent’s trust is far more important. I was working with a slightly older group today, 16 toddlers who I’d had little contact with previously. It’s usually a bit of a struggle to get these kids to eat their fruit, apparently- but when I walked around asking each child ‘would you like some apple? Would you like some watermelon?’ individually, instead of just dumping a pile of fruit in front of them, the results were spectacular. They all responded with smiles and words, ate what they’d chosen and asked for more politely… and those who’d chosen not to eat, seeing the happy atmosphere, gradually wandered over and joined us. IT WORKS. I really liked the watching the girl and the table you pointed out, but I also enjoyed the interaction between the other two over the bib there at the end. Very cool, Janet! I love the video! I was particularly impressed by the ritual of choosing a bib. They all seemed so interested in being involved. Great stuff! Yes, isn’t it surprising the way these seemingly mundane activities intrigue young children? You can see their wheels turning as they work hard to understand everything that is going on and try to figure out what is expected of them. Giving children this time to process everything encourages them to continue to be active learners. i loved watching this video so much, it made me cry. it is so RIGHT to treat children with such fundemental respect, it literally brings me to tears. thank you so much for posting, and spreading this beautiful light and way of parenting and interacting with our children. what a blessing. Janet, I love all your toddler videos, this one in particular. I’m wondering where you found that wonderful table? I don’t think I have ever seen one in that shape and that height before. It breaks my heart to see children strapped into adult sized chairs, or trying to balance on child-sized chairs when they aren’t ready for that yet. That table just seems perfect! This is wonderful. I work with older children (3-6 years) in a Montessori environment, and we use many similar principles. PLEASE keep posting videos like this. I very much want to learn more about using this approach with babies and toddlers, as we are hoping to have a baby of our own someday soon! That is wonderful to watch! It is great to see how you really have to slow down! The kids respond so well to your respect. I LOVE the bit at the end where the baby shares her bib! I watch this and wish I’d watched it five years ago. It makes me cry. If only we’d been given all this information at the hospital. Do you have articles for older preschoolers? Thank you, Julie. Yes, I do. And also, many of the same ideas apply. What kind of information are you looking for? I love this! Thank you! It, like many of your comments, is applicable to all preschoolers, not just infants and toddlers. All of our littlest people are caught in a world where they are treated with less respect than we require them to give others. My problem is getting parents of 3 and 4 year old’s to watch and appropriate the strategies here. Simply because many of your articles talk about infants and toddlers, they don’t think the content applies to them, so they skip right over them! Argh! Curious as to how this plays out with 2 year olds that do not want to stay still? 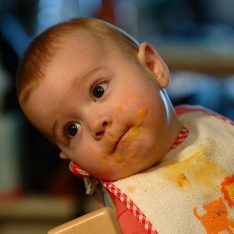 My daughter was brought up with baby led eating, so she moderates her food amount very well, but is not great at sitting still at the table? Any suggestions? 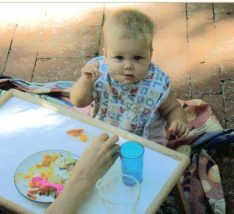 Diane, it is up to the adult to decide how eating will go… Once children are able to achieve sitting independently, they are also ready to learn to sit while they eat, but only if we make this expectation clear and consistent. I think this is all wonderful and I have been following these principles with my girl from the beginning. At least I have been trying to to the best of my abilities. What I struggle with is staying attentive throughout an entire meal. My girl (now 18 months) loves eating and really takes her time. I love that about her, but it’s hard for me to stay attentive for 30 to 45 minutes for one meal. Any thoughts on that? Hmmm… I would try to perceive this positively…as quality time…like dining out with a loved one at a restaurant. This time together is JUST as valid as play…or anything else you might do together. Giving her this time in your presence should fill her up, so that you can take care of some other things for yourself while she plays. You may still need to assert your boundary, of course, while she expresses displeasure. But at least you will be able to do so “guilt-free”, because you really have given her high quality, connected time. I like the clear but kind tone you use in the youtube clip when you spoke to the girl climbing over the table (although I can’t quite make out the first bit) and was wondering what a parent could say to a toddler who has put a foot on the a table whilst they sat eating their lunch? (other than “Please put your foot down”). I was watching this (“Respect is contagious: RIE babies”) and it struck me – how Janet simply offered the wet wash cloth to each child and they put their hands on it. She didn’t say anything and if a child only touched the cloth minimally – she didn’t grab their hand or force her hand shut on theirs to clean the child’s hand a bit further or ‘make’ them participate if they pulled their hand away. I have previously read articles on RIE that speak about cleaning hands but now I feel like am ‘missing’ something so I’d like to hear some more thoughts about hand wiping from a RIE perspective. I also, would like to know this: when children first come to a Parent/Infant class for the first few weeks and are not used to this method of hand washing what words (if any) were said to them when the cloth is offered?